The all new R3S Max Drive impact sprinkler also comes with a full set of nozzles allowing flow ranges from 3 to 8 gallons per minute. This sprinkler also features an adjustable jet stream breaker for changing stream pattern and may be operated in full circle mode or part circle mode by simply adjusting the part circle tabs at the base of the sprinkler. This quality sprinkler is constructed from a cast aluminum alloy body with brass lower turning union. The Max Drive action of this sprinkler uses the perfect combination of drive arm spring tension and engineered mechanical designs to display a beautiful stream pattern in forward and fast reverse mode that results in the absolute best wetted water pattern all throughout the diameter of the circle. The Max Drive stays consistent at low and high pressures. 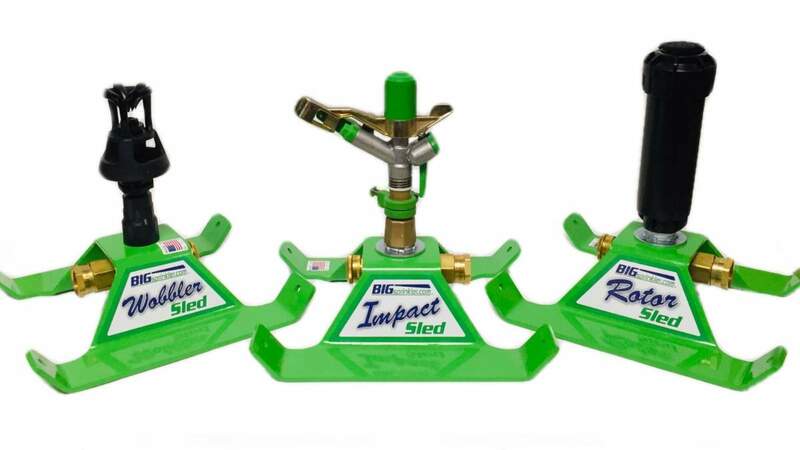 The Impact sled also features a Flow-Through Base design allowing multiple sled bases to be connected in series!